How to cross stitch. 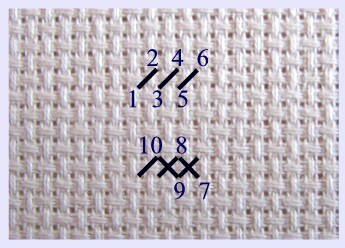 This is a simple tutorial on the basic stitches used in cross stitch. To begin a cross stitch; bring your threaded needle up through the backside of your fabric, leaving a short tail of floss out the back. Work your first few stitches over this tail to secure it. You can also use what is called a loop knot. A loop not is a good choice if you are using two strands of floss (which you do in most cross stitch) or when your design calls for just a few stitches like a flower, star, eye, etc. Fold your threads in half and insert the cut ends in the eye of this needle, leaving a loop at the bottom or tail. Bring the needle up through the back side of the fabric in step one, then down through the fabric in step two and then go through the loop on the back side, thus anchoring your thread down. There are no knots in cross stitch. To finish your row of stitches, run your floss under 3 or 4 stitches on the back. Work each square by bringing your needle and floss up through hole 1 and down through hole 2, up through 3 and down through 4 to make an X. Work from left to right first and then right to left. Work in rows when ever possible. Go up through hole 1, down through 2, up through 3, down 4, and so on. The back of your fabric should be almost as neat as the front. Try not to make jumps of more than 3 stitches of the same color thread on the back. It wastes thread, may show through, and looks tacky. Remember, the back of your cross stitch should be almost as neat as the front if you are a good stitcher. When working a new area, secure the thread behind a few stitches, cut and start a new set of stitches in the new area. For a softer look, your project may call for areas of half stitches. Half stitches of one strand of floss are often used for the sky or mountains and tress in the back ground. A half stitch is half a cross stitch. Up through hole 1, down hole 2, and so on. This is the same stitch used for petipoint and needlepoint, except that peti and needlepoint are worked on canvas. 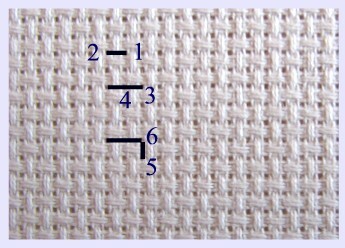 Petipoint is worked on canvas with 16 or more count (or meshes) per inch, which makes it a smaller more delicate stitch. The back stitch is used to outline the design once you are done with all the cross stitches. Outlining will define your design and make it more “finished” looking. You generally use one strand of floss for this. Bring your needle up through hole 1, down through 2, up through 3, and so on. 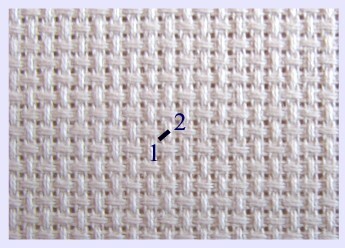 ¼ stitches are used for contours in your design. For a ¼ stitch, bring your thread up through hole 1 and then down through the center of the square you are working on. This is a little harder when using Aida because you must push the needle through the center of the square. 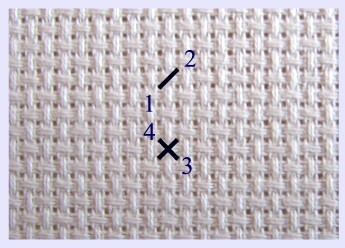 When working with Linen, Jobelan, Lugana, and other fabrics there is a hole in the center of the square of the X, which makes quarter stitches much easier to do. 3/4 stitches are also used for contours in your design. It is a 1/4 stitch and a 1/2 stitch combined. French Knots are occasionally used in cross stitch, usually for things like flowers, buttons, etc. They can give your piece a textured look. First, bring you needle and thread up through hole 1. Hold your needle with your right hand, take the thread with your left hand and wrap it around your needle twice while keeping the tension tight. Keep holding the thread tightly and put the needle back down through the fabric at hole 2. Pull on the loop so it stays wrapped tightly around the needle and pull the needle from the back to make your French Knot. When stitching on linen you generally stitch over two threads of fabric. 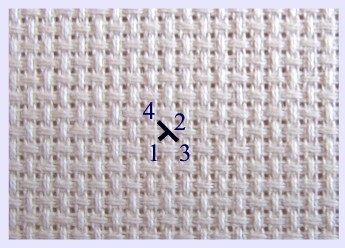 The basic stitch on linen is done from left to right, bottom to top. Each square of fabric for each stitch (cross) is like working in a tic-tac-toe grid. Slant over two threads of fabric and up two threads of fabric. Once you have work about three stitches, the eye will begin to see the pattern and it should make stitching easier. Do your first row of stitches from left to right and then cross back from right to left. The back side of your fabric will show vertical stitches (up and down). Video above is on Stitching over two threads. It is not necessary to use a hoop when stitching on Linen. Instead, hold you hand in a relaxed position with the thumb and forefinger grasping the cloth and the little finger anchoring it. Use a sewing motion rather than a stab stitch. 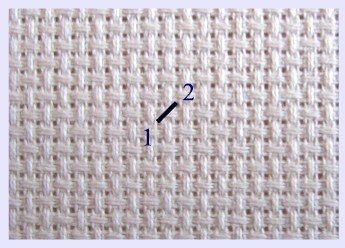 A sewing stitch is one scooping movement in and out. Be sure not to do the stitches too tight as to distort the fabric or too loose. Remember, there are no knots in cross stitch. Knots can either pull through the fabric, or leave bumps. This makes your work sloppy and tacky. Hardanger is a embroidery or needlework method that began in Hardanger, Norway. It was originally done on white or off white Linen fabric with a similar color of thread. Today there is a special 22 count fabric made just for doing Hardanger work called Hardanger fabric. It comes mostly in neutral colors, but there are some colors like purple starting to come out. Most of the stitching is done with either a size 5 Pearl Cotton floss and a size 8 floss for the finer work. Hardanger can be combined with cross stitch to make a beautiful piece of work. Hardanger is easier than it looks. I just recently taught myself how to do Hardanger. Many of my ancestors were from Norway, so I found it interesting and fun. It is so easy that I have already started to create my own patterns for Hardanger. Once you learn the basic stitches, it is fun and easy to create your own patterns. The most basic and easiest stitch used to create a Hardanger design is called the Satin Stitch. Blackwork is a traditional method of cross stitch that is worked on a white linen fabric with a black thread. Originally it was worked using black sheeps wool. No other color was added to the design. For a more modern twist on blackwork, you can us a colored floss to replace the black. This type of design is also referred to as a silhouette. If you like to carry your work with you and don't want to bring a lot of supplies with you, this is a great compromise. You only have to carry one type of floss, your fabric, a needle and scissors (a hoop if you use one). Relaxation (blackwork), by Berlin Embroidery Designs. Swedish Weaving or Huck Weaving, Huck Embroidery. Swedish weaving is stitched on ONE side of the fabric only. This is accomplished by inserting the needle just under the float or vertical threads in the cloth you are working with. The needle never penetrates the cloth. This type of embroidery was very popular in the 1930's and 1040's. I recently found a towel that my Grandmother stitched (pictured below) many years ago. Swedish weaving can be done on any even weave fabric, but Huck fabric and Monks cloth are preferred by stitchers because they lend themselves well to the technique. The type of floss or yarn you use will depend on the size and type of fabric you use for your design. Pearl cotton thread or yarn is typically used to stitch Swedish Weaving. Some cross stitch pattern designers make some very intricate designs. They are often very large designs as well. Designers like Heaven and Earth, Kustom Krafts, Cross Stitch Collectibles, and a few others, split their patterns into several pages. The patterns are to be worked in 10 x 10 grids starting in the left hand corner of the fabric. The best way to figure out where to start a gridded design is to take the stitch count of your pattern and divide it by the stitch count of your fabric. Example: Say the pattern is 240 x 240 stitches and the fabric is 16 count Aida. Divide each side by 16. In this case 240 divide by 16. That means your design will be 15 inches square or 15x15 inches. Find the center of your fabric by folding it in half lengthwise, then in half again by the width. Get a tape measure. From the center you will measure from the middle to the top of the fabric, half of the design height (in this case, half of 15 would be 7.5 inches). Then measure from that point (center/top) again to the left, half of the width of your design. (in this case also 15/2=7.5 inches) That is where you should start the first block of 10 x 10 stitches. Measure from the center up first, then from that point to the left side to figure out where to start your first grid of stitches, starting in the upper left hand corner of your fabric.